The USC poll found that the most important concerns for voters are the high cost of living, at 21.8 percent; followed by jobs, at 9.9 percent; taxes and fees, at 8.9 percent; and illegal immigration, at 6.9 percent. Traditionally Democrat social justice issues tended to be near the bottom of poll concerns, with racism at 1.9 percent; education at 1.4 percent; poverty at 1.2 percent; and the bullet train at just 0.2 percent. The strongest single issue for Democrats is the 5 percent of voters concerned about Republican President Donald Trump. Women voters are more concerned than men regarding the high cost of living, at 22.6 percent; jobs at 10.1 percent; and illegal immigration at 7.7 percent. Women are about a third less concerned than the average voter about taxes and fees at 6.9 percent; but only half as concerned about the environment, at 2.4 percent (as opposed to 4.4 percent for men). 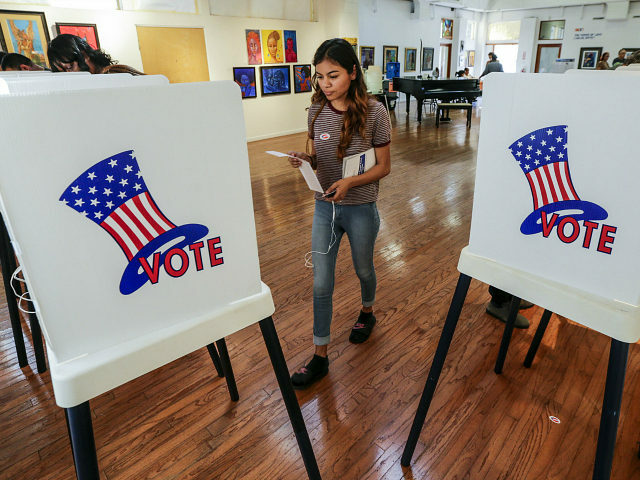 In what may be the political equivalent for Democrats of the dead canary in the mine shaft, women are concerned more concerned that California is headed in the wrong direction by 57.6 percent, versus 53.6 percent for men. Concerns about high costs are the most important issue for all age groups, but 18-to-44-year-olds are the most, concerned at 22.9 percent. Younger voters are much less concerned with taxes and fees at 5.1 percent, compared to 11.4 percent of 44-to-64-year-olds, and 12.2 percent for those 65 and up. But young voters, shockingly, are more concerned than average voters about illegal immigration at 7.4 percent. Hispanics voters are less than half as concerned as white voters about taxes, at 5 percent; a third less about President Trump, at 4 percent; and only one-fifth as concerned about California state government, at 1.2 percent. But Hispanics are almost twice as concerned about jobs. Surprisingly, Hispanics are only slightly less concerned than the average voter about illegal immigration at 6.2 percent. On an income basis, Californians making less than $50,000 per year are a third more concerned about jobs, at 13.4 percent, than the average voter. But almost shockingly, voters that make under $50,000 are slightly more concerned about taxes and fees at 9 percent than higher income voters at 8.8 percent. Generally lower-income non-college graduates are most concerned about taxes and fees, at 9.4 percent, compared to generally higher income college graduates, at only 6.1 percent. California voters favor cancelling the gas tax and fees to build infrastructure (supposedly) by 54.2 percent to 45.8 percent. Voters that make under $50,000 are the most in favor of canceling the gas tax by 57.6 percent, versus 52.5 percent of those making over $50,000. Women oppose the gas tax by 53.3 percent, only slightly less than the 55.3 percent of men. The only demographic favoring the gas tax is 18-to-44-year-olds at just 50.3 percent. With the 2018 election for governor heating up, the California politician with the highest statewide favorability rating is Gov. Jerry Brown at 40.3 percent. None of the 7 declared candidates for governor are in the top 12 for political favorability in the state. Democrat Lt. Gov. Gavin Newsom is currently leading the race to replace termed-out Brown, with 24.5 percent support. But the race has narrowed with former Los Angeles Mayor Antonio Villaraigosa, at 16.3 percent. Virtually unknown before he sponsored the gas tax repeal, Assemblyman Travis Allen (R-Huntington Beach) is in third at 11.8 percent.